Bodice draft of simple kameez can be used to prepare the draft of night dress.Night dress is easy fitting garment.Hence extra ease is added to bust and hip measurements. Scye depth is increased by ½ ".If the dress is stitched with sleeves, width of the sleeve is also increased according to taste.Length of the dress is also depends upon the taste. 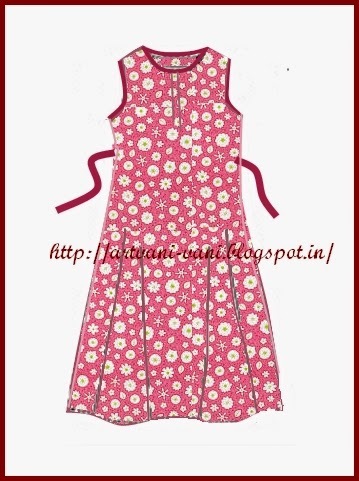 I feel cotton material is with dainty prints are suitable for night dress. Mark point A on the fold. From point A draw a perpendicular line to the fold. On this line mark C such that A-C =½ of Shoulder width + ¼”. A-J = Neck width =1/12th chest + ¼” or to taste. A-K =Back neck depth = 2” or to taste. A-L =Front neck depth =A-K or to taste. From points D, E and B draw perpendiculars to the fold A-B. On the line D-F mark G such that A-B =D-G. Join points C and G.
On the same line mark point H such that C-H =¾".Join J-H.
On the perpendicular at B mark point J such that B-J =¼ chest + 10” or to taste. Join F-J. 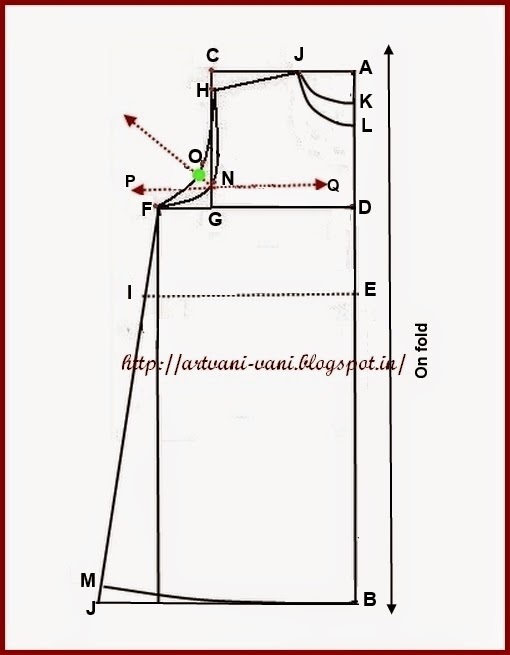 Perpendicular line drawn from the point E meets the line F-J at point Y. E-I is the waist line. On the line F-J mark point M such that M-J =¾” Join points B and M by a curved line as shown in the figure. Mark point O such that N-O =¾”. Through the point N draw a line P-Q parallel to D-F Bisect the angle ∟PNC. Z-N is the bisecting line. On this line mark point O. Shape back neck J- K and Back scye H-O-F. Shape front neck J-L and front scye H-N- F.
Cut the draft along the lines K-J-H-O-F-I-M-B. Separate the two layers by cutting along the fold. Keep the bottom (which has no markings) layer aside. This is draft of the back. Take the top layer and cut along the front neck line J-L and front scye H-N-F. This is the front of the draft. Cut an opening X-Y measuring 4”or to taste on the front pattern piece as shown in the above figure. Finish the neck opening as explained here. Join front and back by sewing along the shoulder lines. 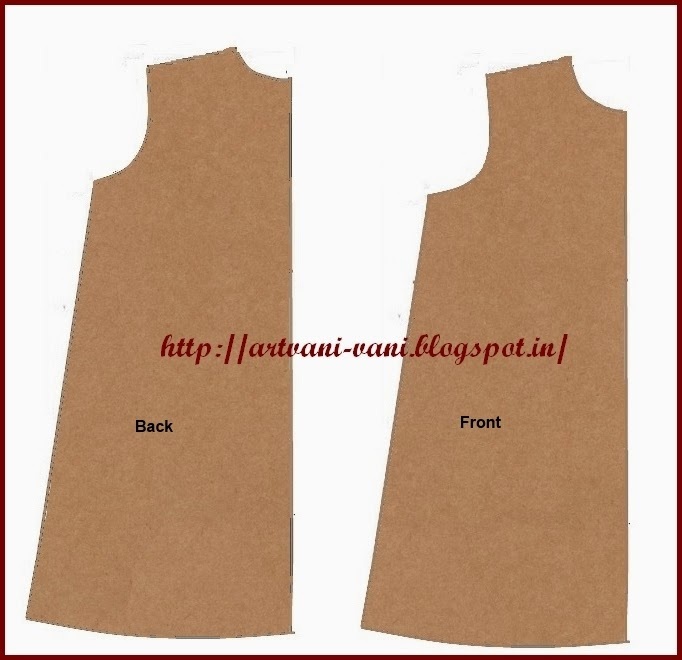 Finish armholes and neck with piping as explained here using bias strips of same material or contrast material. Stitch a belt using the remaining cloth If you want to tie at the waist line. Stitch belt carrier bars at two sides at I and I" and at E on the back and pass the belt. Simple night dress is ready! Hi mam,I just love your instructions.can u please teach how to stitch a ladies shirt with yoke and shirt collar. 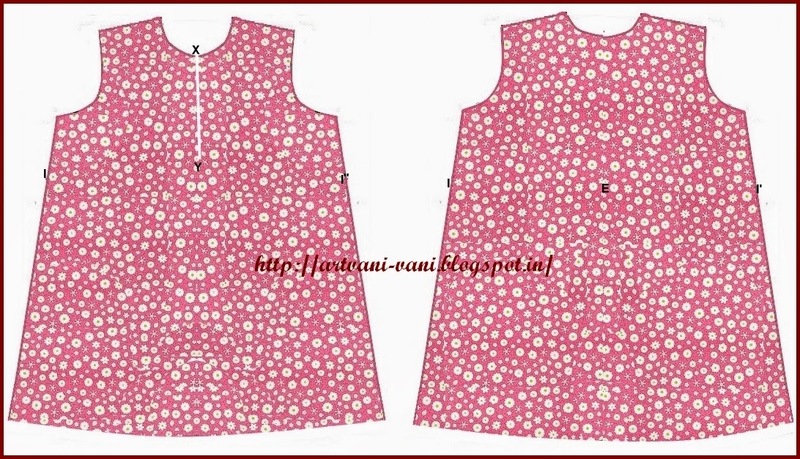 Hi Vani, can you pls show me the tutorial for pillowcase dress. You cannot down load my instructions.I have disabled Right click,I was forced to do it as some used to copy my posts and post in their blogs .I do not mind if they use my blog and learn,I do not like cheating.I cannot post videos as I have got no help to take videos.All are working and busy.Sorry! Hello mam, do you teach in person also. I want to learn sewing and embroidery. I live in Bangalore. Sorry I will not take classes.I will post tutorials when I find time.It is my hobby. Wonderful blog you are maintaining with wonderful people who has passion in threads,designs and cooking which is my favorite subject to explore. Out of this passion I am into service of spreading knowledge to people who really needs to learn and earn.We Youngsters need blessings from elder people like you. Wish to meet you if time allows. Dear Vani, I'm so impressed with your easy to follow tutorials. I was wondering if you could post a tutorial on how to sew a hoop skirt/ crinoline skirt or a poofy underskirt to wear under ball gowns.